Usain Bolt - Back, But as an Entrepreneur? May 26,2011 - Mark this date, folks...Usain Bolt (World and Olympic gold medalist and record holder in the 100 metres and the 200 metres), will run for the first time this season, at the Diamond League Meet in Rome on this date. He said in a television interview, last night, that he's recovered from injury, feeling great and will be defending his titles at the World Championships, so look forward to a good showing from him. (Usain Bolt retired early in the 2010 Track and Field season, due to a back injury. His last race was against Tyson Gay at the DN Galan Meet in Stockholm, Sweden, where Gay beat him 9.84 secs to Usain's 9.97 secs ). Speaking of good showing, Usain's new sports bar and grill, Tracks and Records will be launched soon. He's partnered with The Kingston Live Entertainment Group (The KLE Group), to create a "first of its kind" sports bar and grill in Jamaica. [The KLE Group creates state-of-the-art metropolitan nightclubs and bars that draw a discerning clientele. Its directors are husband and wife team, Gary and Tina Matalon - who also operate Fiction Lounge (a nightclub), at the MarketPlace, in Kingston and Kevin Bourke]. The state-of-the-art sports bar is over 7,000 square feet large, features Usain Bolt memorabilia, a humongous big- screen TV and televisions in every nook and cranny of the sports bar, ensuring patrons access to the latest sporting events, worldwide. The table tops in each seating area, are really LCD monitors that enable you to order from a popup menu as well as control the TV in your area of the bar. Tracks and Records is WIFI-enabled, thus enabling you to have Internet access whilst you work and socialize. Really billed as "Kingston's newest and trendiest place to dine, dance and do just about whatever moves you", its owners say that families are also welcomed. ...Tracks and Records will supposedly be a great hang-out-spot for trendy, upscale patrons who wish to meet there for business or pleasure. (It's located at the Marketplace on Constant Spring Road in St. Andrew). Initial reports say the food is good. Total capital outlay: a cool US $2 million...yep folks, a cool JMD $169.1 million put up by Usain and his co-owners. Congrats to Usain and Kingston Live Entertainment Group re the development of Tracks and Records, we wish them every success in this venture! Please see pictures of Tracks and Records here (via Jamaica Gleaner). Just press the numbers beneath the inset photo, to scroll through the pics. I understand that there had been rumors on Wall Street that the sale would have happened, so many weren't surprised to hear that the sale is to take place by year end. Burger King is one of my favorite brands and I live in Jamaica! (It's the #2 fast-food chain in the USA, behind McDonald's). But when McDonald's came to Jamaica in the 1980's-1990's, I really couldn't see why it was the world's #1 fast-food chain. 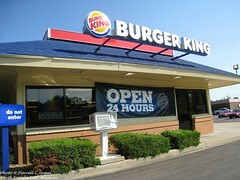 The food was ok, but in my opinion, just not as great as Burger King! I don't have burgers often due to the high caloric content, but Burger King fries are to die for!!! And consider my surprise when I heard that over the past year, their stock price has decreased due to the economic downturn in the USA and Europe! Yes, due to the mainly male Burger King customers being made redundant/laid off, Burger King wasn't selling as many burgers and other items on their menu. Burger King is being sold to 3G Capital for US $4 billion, $1.2 billion of which represents equity and $2.8 billion representing debt. The sale means that the company will be privatized. 1) 3G Capital is a little known investment firm, whose backers include Brazil's Jorge Paulo Lemann, who sits on the board at Anheuser-Busch InBev NV. (Forbes magazine estimates his fortune at $11 billion). a) Shareholders will be ok with receiving $24/share for the company - which went public just four (4) years ago at an initial share price of $17. b) The deal's valuation - at almost nine times cash flow over the last year - is higher than previous restaurant deals and could pave the way for more restaurant deals. c) The deal would give 3G Capital the freedom to do what was necessary to bridge the gap between Burger King and McDonald's. iii) Expansion of its menu with salads and apple dippers - which appeal to moms and kids - and the addition of high-profit beverages like lattes, fruit smoothies and frappes. She's really special to millions of people around the world, so please do your market research before doing anything rash with her. (I would like to thank RETAIL MEMORIES! with Darrell James for the use of his Flickr inset photo of a Burger King restaurant on Wornall Rd. in the USA). 2) Article,"Burger King agrees to $3.3 billion sale to 3G Capital", by Lisa Baertlein, Reuters, via Yahoo News, September 2, 2010. From breakfast to dinner, executives often have their meals on the run. This is because their busy schedules don't often allow for lengthy meals, unless business is somehow included. For those executives who love to savour food, but don't necessarily have the time to prepare lengthy meals, you can find healthy 30-minute-meal recipes online that make eating "expedient" food, a pleasurable and enjoyable experience. However the key is to prepare them before-hand, so that you aren't rummaging through your cupboard or raiding your refrigerator to find ingredients for these meals...at the last minute. Most of these meals can even be prepared days in advance and stored in the refrigerator...for reheating or for removal from same, when you are ready to eat. (Ensure that they are stored in refrigerator-proof packaging to maintain their longevity and vitality, however. Even though some of this is lost during the refrigeration process). If you are fortunate to have a cook or a household assistant, they can also use these recipes to provide healthy meals for you and your family. Foods and ingredients that will titillate your taste buds, whilst providing the healthy nutrients needed to refresh and renew you...not just fill you up! You should also use foods rich in the B vitamins...especially complexes of B3, B12 and B6 that strengthen nerve endings and foster the delicate balance of chemicals in the brain. Protein-rich foods such as milk, eggs, meat, liver, fish, potatoes, peanuts, whole grain cereals and green, leafy vegetables like lettuce, spinach (callaloo), are great sources of B-complex vitamins. Using more of these foods in your 30-minute meals will not only ensure that your brain and nerves function optimally, but that your entire body is able to deal with the every-day stressors that come with being a busy executive! 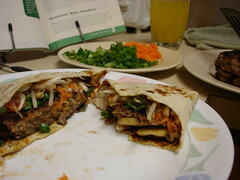 (I would like to thank StubbyFingers for the use of her Flickr inset photo above, entitled, "Moo Shu Pork Pockets").